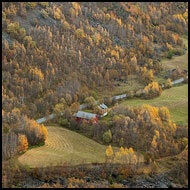 I had a chance to visit Hemsedal mountain area during a period when autumn colors were just incredible. I have spent two days walking around and photographing the natural beauty in Hemsedal and especially the Grøndalen valley. The locals told me I missed the best colors by one week, still am not sure if I managed to capture even one percent of the beauty of those two days.